I began my research by looking into the spread of sermons in the Northeastern colonies. I wanted to see how the content of these sermons was reprinted, how long it would take for them to spread geographically, and if the message was the same from first publication up until the last publication. As I began my research though, I began to find out that sermons were not actually being reprinted in newspapers. There was no redistribution of sermons through any of the newspapers I found. They didn’t have any information that I could come across which was public redistribution of work by the church. No special sermons that were pivotal to turning the views of society against a looming threat to the good conscience of the colonists or the emerging youth. 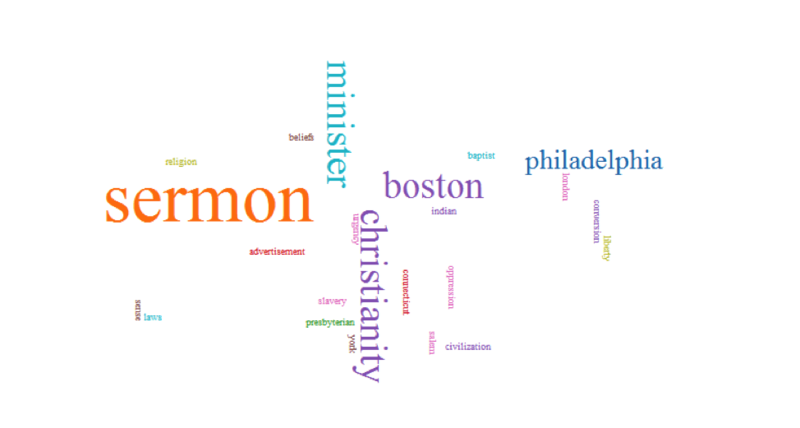 On my word map the biggest words are “sermon” “minister” and “Christianity.” Nothing about the message of the Gospel or Jesus was even said. How would someone even know what Christianity was about, what the core values were? I always assumed that culture back then was dominated by religion and it just made sense that sermons would be widespread because what else would they have to write about? What could be a higher priority? Instead I actually came across many ads for sermons copied down, or responses to sermons, or for sermons to come. These ads did not seem focused on really spreading the message of Jesus and how to save others. These were intended to disagree with a sermon that had just happened, or to explain more in depth what a sermon may have meant. 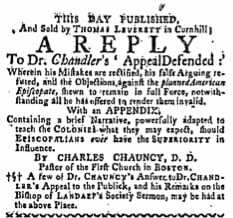 Some of these Ads were blunt in attacking sermons such as one where someone wrote “A REPLY To Dr. Chandler’s ‘Appeal Defended:’ wherein his mistakes are rectified, his false arguing refuted, and the objections against the planned American Episcopate” just publicly insulting basically everything that man had said. There were no Ads that had to do with books or sermons that had to do with “saving” fellow colonists or the Native Americans. Nothing that has to do with spreading the Gospel, or good for the sake of the greater good. You also don’t see these ads go looking to attack the different denominations too often. The advertisers mainly have a problem with how somebody is going around teaching God’s word. It is very much centered on individuals, who they are responding to, or themselves the writers. The book Sacred Scripture, Sacred War by James Byrd shares an interesting story that pulls back the curtain on motives for the use of scripture and the goal of most colonists in the revolutionary time, or at least by those who influenced most colonists. Thomas Paine’s famous pamphlet Common Sense used many bits of scriptures from the Old Testament to encourage the patriots to rebel from England. The problem here is that he was confronted by John Adams about his beliefs and he laughed at him. He didn’t have any respect for the Bible at all, or for what the message may really be. He wrote what he thought was necessary to inspire colonists, and did not care if the interpretations were correct or not. The book also shares how most colonists got their religious education from the clergy, so few were pushing themselves to learn on their own, because they trusted their spiritual leaders and what their peers were doing. This made more sense to me as to why these ads seemed to attack other clergymen and theologians, because they knew their congregation were reliant on them to learn, and if they didn’t intervene chances were slim the people would do fact checking themselves or have exposure to another reputable spiritual leader in their community. Revolutionary War Sermons by David R. Williams also supports the claim that most people relied on their pastors and ministers for spiritual guidance and education. With intelligence and morals entrusted to these clergy, they would in fact have a huge influence on their congregations. In his introduction Williams says that these men would march hundreds of miles from home, leaving their families and their farms to die in battle for God. Because they weren’t taught in detail about how taxes were unfair or why Parliament was so corrupt and unjust. They were taught by patriotic clergymen that this was God’s will to fight for this freedom. There was almost no one else who would have as much respect as these clergymen had who could challenge their authority. I didn’t see any free messages to the people from ministers in any of the newspapers. It seemed like these people were aiming to make a buck. They had the short ads in the paper that got your attention; saw the extremity of the language used and how what they possibly heard in church or read before was completely wrong and needed to get ahold of this to finally hear some corrections. These writers who made the advertisements just wanted money and fame. The way the ads were written was as if they were big shot orators and pastors, but I would not come across their names again much later. They just exploited the use of faith back then to make a quick buck at first glance. That was my first assumption before I investigated the culture of ministry back then. After reading Williams and Byrd I can see how it was actually very important to the clergy to correct misuse of the scriptures, because there was almost a blind faith in congregations about the infallibility of their preachers and orators. Through investigation these authors were able to prove just how misguided that trust could be sometimes. Maybe it is possible the idea of faith back then and today have different meanings culturally, but it is interesting to notice how there were not many elaborative, free forms of text distributed by the church in print to the masses. Just these books and ideas of responses that they have to buy. Byrd, James P.. Sacred Scripture, Sacred War : The Bible and the American Revolution. New York: Oxford University Press, 2013. Gribbin, William. “Republican Religion And The American Churches In The Early National Period.” Historian 35.1 (1972): 61-74. Parcell, Lisa M. “Early American Newswriting Style.” Journalism History 37.1 (2011): 2-11. Williams, David R. Revolutionary War Sermons: Photoreproductions. Delmar, NY: Scholars’ Facsimiles & Reprints, 1984.